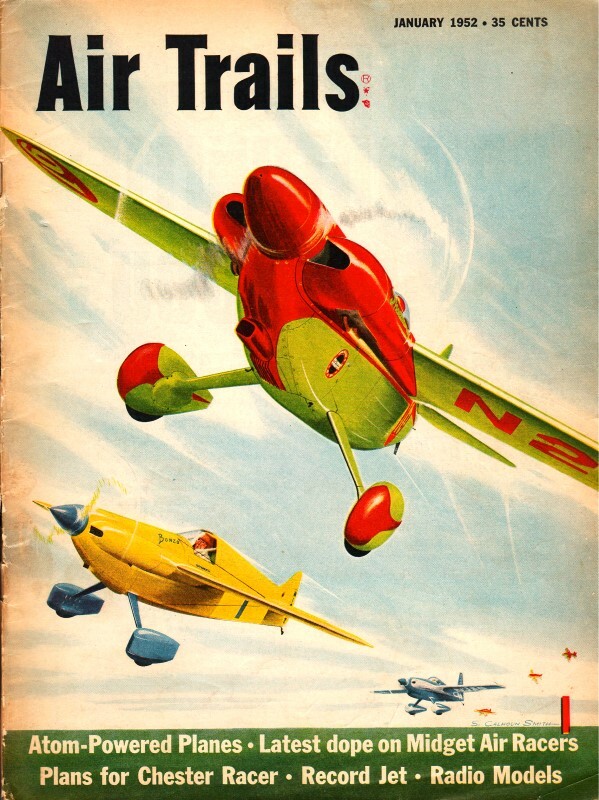 Creativity and ingenuity was needed more often by aircraft modelers back when various aspects of the hobby were in the development stages and access to a prefabricated device was not as ready as today. 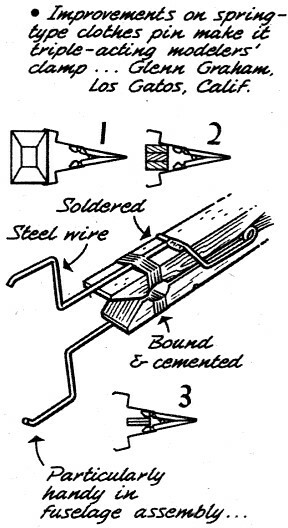 If you need a special-purpose product or method nowadays, a Google search will usually turn up a solution in the form of an off-the-shelf item and/or instructions on how to do it yourself - sometimes even with a video to show you how to do it. 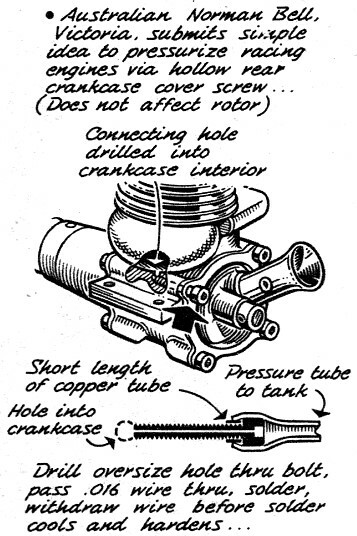 In the middle of the last century, if you wanted a component or gizmo other than common things like wheels, propellers, and bell cranks, you had to make them yourself from on-hand materials or do without. I often am amazed at the ideas presented in these Sketch Book installments. Check out the device designed by Mr. Mustafa K. Artam, of Istanbul, Turkey, for checking relative thrust of carved free flight propeller blades. This month's entries also come from Bristol, England, and Victoria, Australia. Have you developed something new in construction, control, or flying that might interest other modelers? Send a rough sketch - we'll redraw it and pay $5 for each one accepted. Sorry, we cannot acknowledge or send back submissions. 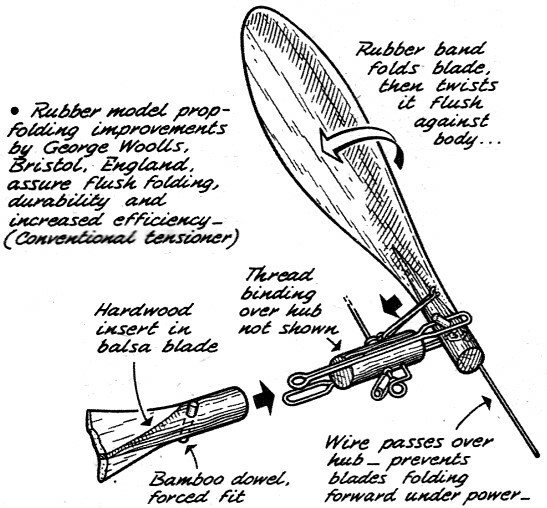 Improvements on spring-type clothes pin make it triple-acting modelers' clamp ... Glenn Graham, Los Gatos, California. C.H. Beiger, Chicago, Illinois, devised slotted dorsal fin for guide and "stop" of dethermalizer ... made of plywood or balsa sheets. 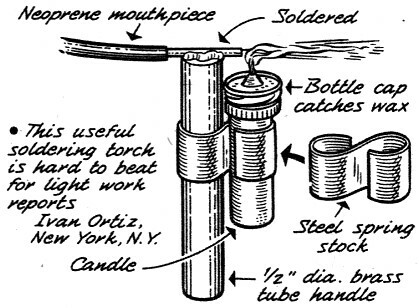 This useful soldering torch is hard to beat for light work reports Ivan Ortiz, New York, N.Y. 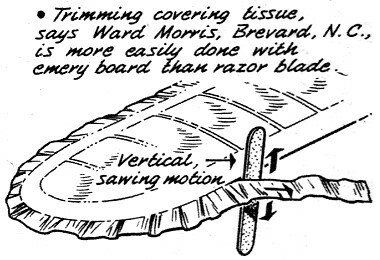 Trimming covering tissue, says Ward Morris, Brevard, N.C., is more easily done with emery board than razor blade. 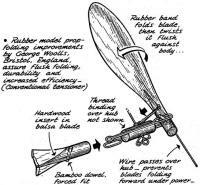 Mustafa K. Artam, Istanbul, Turkey, devised simple apparatus for checking relative thrust of propeller blades. 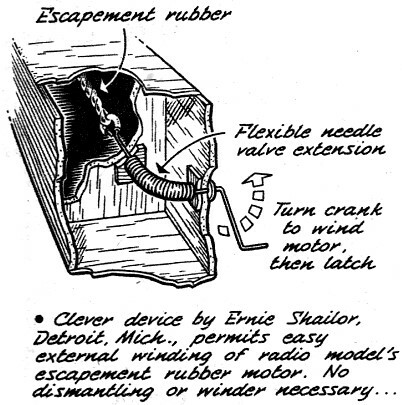 Clever device by Ernie Shailor, Detroit, Michigan, permits easy external winding of radio model's escapement rubber motor. 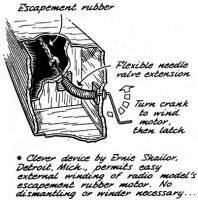 No dismantling or winder necessary.